It's Mother's Day next weekend and YOU can do something for mothers everywhere. On Saturday May 10th, at the Lachine Canal, there's a 5-kilometre walk to raise funds and awareness for an organization that promotes maternal and child health in the developing world. It's a registered Canadian charity called Save the Mothers. The walk is an annual event in other Canadian and U.S. cities but new to Montreal this year. McGill medical students Kammie Chow and Cristina Mitric are organizing the walk. They join Sonali Karnick in studio. Dr Jean Chamberlain Froese, is the Canadian obstetrician and gynecologist who founded Save the Mothers. She's also the executive director. She's on the line. Community Wings is a new non-profit group that is starting small but dreaming big. The volunteer organization in the West Island and Vaudreuil helps people who are going through traumatic situations, whether it be a fire, domestic violence or desperate financial need. Community Wings is run entirely by volunteers, but eventually they would like to expand their operations to offer a lot more services more effectively. Tonight, they're holding a silent auction and a wine and cheese as a fundraiser at the Opti-Centre in Vaudreuil. Selina Richard is the founder and president of Community Wings and she joins All in a Weekend host Sonali Karnick in studio. Change doesn't happen overnight, especially when it comes to human rights. Equitas, an international human rights education organization based in Montreal, recently gave out its annual honours to organizations that are making a difference. In Yemen, in the Middle East, the Youth Leadership Development Foundation works to empower young men and women to take charge of their future. One of their big achievements right now is that they're very close to establishing a legal age for marriage in the country to help young women. 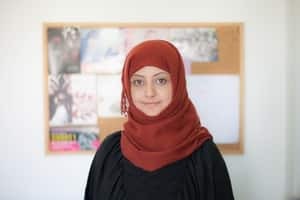 Safa Rawiah is the general manager of Youth Leadership Development Foundation of Yemen. She's in Montreal to accept the award from Equitas. Ian Hamilton is the executive director of Equitas. They spoke with Sonali Karnick in studio this morning.